Our family relocated to San Diego in October 2007 with a purpose: Being close to my father-in-law, so that he could continue to live independently, which he did until his passing, at age 95, in January 2017. Eleven years is long enough. The Wilcox clan, or part of it, contemplates exodus, because the area is increasingly less desirable: Cost of-living and recent zoning changes that will increase population density by way of building more multi-unit housing. My wife and I are considering many different possible locations to move—anywhere from Arizona, Colorado, New Mexico or Texas to Delaware, North Carolina, or the Mid-Atlantic region we left to come here. That said, closer-by would be more practical, particularly if we were to buy a home. Earlier today, Annie and I spent several hours in Julian, Calif., where we looked at four houses for sale. The ramshackles, three of which sold for under $300,000, all but squashed any interest moving to the quaint, tourist destination. I joked with Annie that we’d be better off spending $50,000 on a plot of land and putting up tents. We chose Julian because of housing affordability, mild-enough climate, and mountainous locale rich with wildlife and forests. I was enamored by seeing recognizable trees—after so long looking at palms—and the prospect of gazing at a canopy of stars filling the night sky. A year ago this month, Annie and I put in a $600,000 offer for a cute Spanish-style property we call the Schoolhouse, in our San Diego neighborhood. Later, after negotiations for repairs collapsed with the seller, we walked away the same day our final mortgage loan approval came through. The purchasing process taught us valuable lessons for future home buying. Among them: We changed strategies, lowering our budget by more than half and deciding to put down as little as possible—rather than the planned 20 percent. We won’t live forever, and likely not the length of the typical mortgage. We are better off keeping funds to live; any monthly mortgage payment less than our current, hefty rent would be comparable relief. Who knows, we could choose to be renters forever instead. But that’s unlikely because in most markets that we find appealing to relocate, housing prices are within our budgeted range while rents are too close to what we pay now. San Diego climate is fantastically pleasant. Saving a little makes no sense when giving up a lot lifestyle-wise. Buying, then, is more likely outcome. Choosing a new place from afar is a daunting task, however. Among the different research tools, Sperling’s Best Places is so far the most helpful, particularly the thingy comparing cities. By way of actual numbers, reasons to move elsewhere are clearer. Sperling’s cost-of-living index uses 100 to represent all of the United States. San Diego’s overall score is 166 and 292 for housing. Median home price: $622,700. Two-bedroom apartment rental: $2,260. Where the area ranks well: Climate comfort rating of 85. By comparison, Julian is much lower but overall higher than the national average: 127 overall cost-of-living and 169 for housing; median home price is $363,900. But there is a significantly higher vacancy rate—36.5 percent versus 7.57 percent in San Diego. Meaning: Negotiable pricing in the one, but bidding wars in the other. Rentals are much fewer in Julian and, as such, not much of an option. Climate comfort is 75; quite good. Let’s arbitrarily choose another city—Charlotte, N.C., where cost-of-living index is 97 overall and 91 for housing; median home price is $210,200 and two-bedroom rental $1,260. Tucson, Arizona: 95 overall and 83 for housing. Median to buy: $179,700. To rent: $940. The greatest percentage of owner-occupied housing is in the $100,000-$149,999 range (27.11 percent). San Diego: $500,000 to $749,999 (26.91 percent). Tucson climate comfort rating is 78, BTW. But why? Isn’t it friggin hot there? We might as well burn money, when tallying up the costs of living in San Diego as renters, or worse, homeowners—of which there are fewer than the national average or compared to many other cities: 43.91 percent owned; 48.53 rented. Wanting to relocate and doing so around age 60 (Annie, and one-year less for me), potentially long-distance, is something else. I had hoped Julian would check enough of the boxes, with respect to affordability, livability, and desirability. I was invigorated by the mountain air along with the town and terrain bearing enough familiarity to my Maine homeland. The ruggedness of the area appealed to my core sensibilities. But amenities—simple things like affordable groceries—are long-ways drives; spread-out neighborhoods increase risk of isolation; and desirable homes exceed our budgeted price. The ideal of Julian isn’t the reality we encountered. 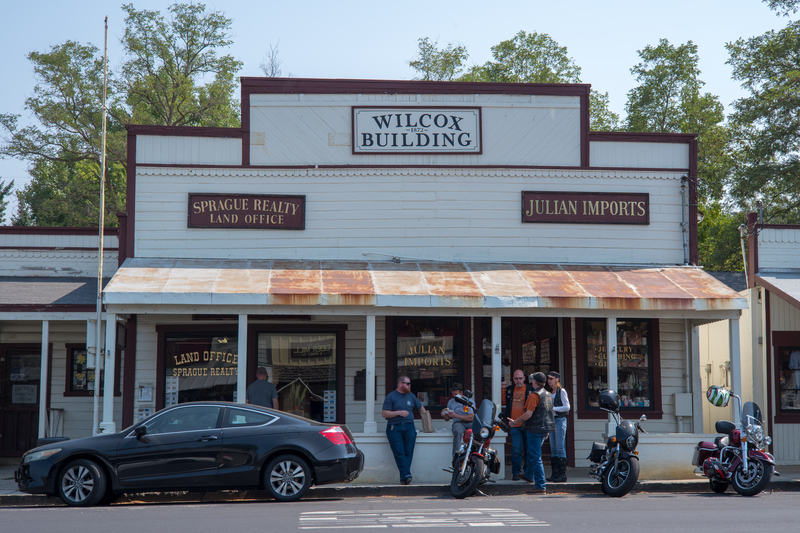 Still, I briefly felt a sense of destiny, when seeing the Wilcox Building, which is the Featured Image shot with Leica M10 and Summarit-M 1:2.4/50 lens. Vitals: f/11, ISO 200, 1/180 sec, 50mm; 10:35 a.m. PDT. The realtor’s office we visited is to the left. The motorbikers in front were among many roaring around town today. The real estate agent told us they’re weekend regulars. For me, the bikers punctuated the rustic ambiance and country charm. The men could as easily have been hunters or snowmobilers, if Maine. Would you believe, and I confess honestly: Somehow we left Julian without tasting some of the famous apple pie. How criminal is that?